Pakistan is working on a major roll-out of bonded VDSL2 to deliver 50 Mbps, five times the top speed of the nation's highest level of service today, at a construction cost of just $200-300 per home passed. Pakistan Telecommunication Company Limited (PTCL), the nation’s state-controlled phone company, is deploying VDSL2 Bonding technology to provide existing digital subscriber line (DSL) customers with speeds up to 50 Mbps. The project leverages Alcatel-Lucent’s VDSL2 Bonding expertise and will be completed by the end of the second quarter of 2011, according to a report in Daily Times. VDSL2 technology is a good cost-effective option for Pakistan to upgrade existing DSL because it could serve as a platform to deliver broadband, video, and phone service, much like AT&T’s U-verse known as triple-play. VDSL2 Bonding takes two copper-based VDSL2 lines per subscriber and aggregates them—almost doubling the bandwidths available to existing customers, or expanding high-speed broadband access to areas that are underserved today. PTCL selected VDSL2 over fiber to the home (FTTH) primarily because of cost. With fiber installs twice as expensive as a DSL upgrade, a developing country like Pakistan couldn’t justify the higher price. VDSL is expected to be an important part of broadband expansion in the developing world, particularly in Africa, southeastern Europe, and central Asia. Longer term, Pakistan is building Fiber To The Home (FTTH) network for much higher bandwidths, and several thousand homes have already been wired with fiber as a pilot roll-out in Islamabad by a Pakistani Internet service provider (ISP) called Nayatel. 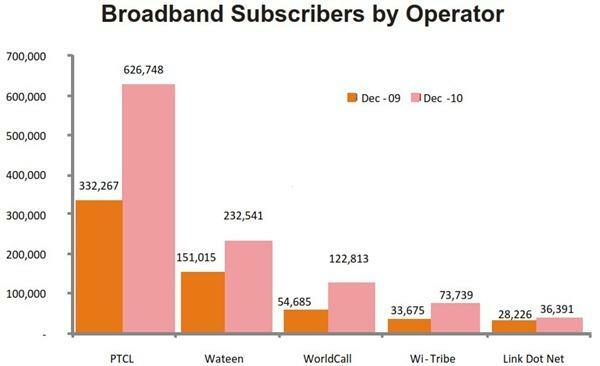 With just over a million broadband subscribers as of October 2010, Pakistan’s broadband subscriber base is small. But it is in the midst of explosive growth with an increase of 63.5% from the 643,892 in December 2009. While the DSL remains the main technology used to access broadband services in the country, alternative wireless solutions WiMAX and EV-DO are catching up fast. The number of DSL users grew by 96.5% from 262,661 in June 2009, according to Business Monitor International (BMI). By contrast, subscriber figures of WiMAX and EV-DO increased by 246.6% and 708.5% over the same period to reach 306,665 and 181,947 respectively. The popularity of mobile broadband services is likely due to more affordable pricing plans bundled with low-cost mobile devices. Moreover, two-thirds of the population reside in rural areas where fixed-line infrastructure remains poor and wireless broadband service therefore becomes an attractive and relatively cheaper method to bring connectivity to the underserved regions. At current pricing, PTCL offers a basic broadband service package with a 256kbps connection limited to 1GB of data for Rs. 299 ($3.50) a month. This low-cost package is designed for users interested in email and light browsing, not heavy downloads and uploads. The next level is the popular 2Mbps unlimited package for around Rs. 1499 ($17.78) a month. And then there is 10Mbps service for an expensive Rs. 8500 ($100) a month. With the upgrades, PTCL can either raise speeds, reduce prices, or a combination of both. Other than the 256kbps service, all other broadband packages from the company offer unlimited use. Considering all the massive negative propaganda in the Indian and western media about Pakistan, it is interesting to see that some Americans are noticing the high-speed access build-out in the "failed state" of Pakistan by a state-owned telephone company. In a provocatively titled post "Osama bin Laden Getting Faster Internet Than You Have: Pakistan’s 50Mbps Future", an American blogger Philip Dampier complains as follows: "While America’s heartland is being wired for 3Mbps DSL service, residents in Pakistan are getting ready for speeds up to 50Mbps thanks to a major broadband expansion in the country". only a short term fix 50MBps is the theoretical maximum VDSL can deliver.Whereas fibre can theoretically go way way up something like 500GBps so it is an investment that will be relevant atleast for the next 20-30 years. 100 Mbps fixed can be achieved with 4G wireless so whats the point in putting all that expensive VDSL2 equipment when twice the speed is available wireless with zero last mile infrastructure cost + mobility? Anon: ".Whereas fibre can theoretically go way way up something like 500GBps so it is an investment that will be relevant atleast for the next 20-30 years." It's more expensive longer-term project being implemented by another Pakistani company called Nayatel. It's started with a pilot rollout to several thousand homes in Islamabad. The quickest way to offer 50 Mbps to millions of people for now is to do what PTCL is doing by upgrading DSL. Nope that is 4G broadband.VDSL2 is very very maintenance intensive with repeaters placed every 200 mts thus that many links that might break. We already have VDSL2 in India from 2009 i.e 50MBps.Though we manage to do this in one single line not 2 lines as mentioned in this article. That's the situation in India FYI.. I wonder why the 2010 Oxford broadband study ranks Pakistan at 60, two places ahead of India at 62. And the broadband tariffs are the lowest in Pakistan. Even before U.S. special forces succeeded in their mission to capture or kill Osama bin Laden earlier today, Twitter users were recording a rough outline of the events to come. Sohaib Athar, who describes himself as a 30-ish independent software consultant "taking a break from the rat-race by hiding in the mountains with his laptops," happened to be in Abbottabad, Pakistan, about 10 hours ago. Athar heard the helicopters used during the raid. He shared updates live on Twitter, according to the microblogging service's timestamps. And he's likely to be a footnote in history as a result. riaz haq g u send lot of information, it is very helpful. With the placement of UAE's Yahsat communication satellite by a European Ariane 5 ECA rocket on April 22, satellite broadband service by Yahclick in now expected to be available by the end of this year in Pakistan. The price of customer premises equipment will be around $700 one time (deep discount on the $2000 cost) and the customer needs to pay $40 per month to enjoy 2Mbps of Unlimited Bandwidth Internet connection. The satellite broadband internet service in Pakistan will provide Communication services to remote areas where telecom infrastructure does not already exist. Yahsat 1B uses state of the art Ka band multi spot-beam technology, achieving high bandwidth. KARACHI: The local assembly and manufacturing of low-priced ‘smart phones’ will start soon in the country by Pakistani companies in collaboration with chip designers and Chinese manufacturers. Pakistan Telecommunication Authority (PTA) Chairman Dr Muhammad Yaseen said this while talking to media persons at the interactive session for ICT stakeholders – ‘Connect ICT Forum 2011’, organised by Pegasus Consultancy at Karachi Expo Centre here Wednesday. He said several memorandums of understanding (MoUs) have been signed recently, between local companies and Chinese manufacturers and chip designer Falcom for producing smart phones in Pakistan. The event was organised by PTA in an effort to start local assembly and manufacturing of smart phones, which are currently being imported. Responding to a question about the misuse of SIMs, he said that PTA has blocked 16.5 million mobile SIMs and during the ongoing data cleansing under third phase, PTA is receiving 400,000 quests per day on its complaint number 668. Yaseen hoped that no unidentified SIM will remain in cellular phone network after May 17, which is the last to confirm the validity of your SIM and clean your mobile phone record. He said the sales of handsets will not be affected due to the ongoing data cleaning campaign. Replying to a question about smuggled handsets, he said that PTA has submitted its input to the IT Ministry in which it has suggested two-pronged policy. First, to impose ban on these handsets at customs stage where IMEI numbers are not mentioned, and second, impose a ban on the sale of such phones in the country. He pointed out that millions of mobile phone imports were allowed without type approval of authority after 2005, therefore handsets without IMEI numbers flooded the local markets. To a question on mobile phone banking, he said that a final meeting will be held between PTA and State Bank of Pakistan to discuss and come out with consensus on modalities and authentication issues on May 11. Earlier, speaking at the forum, he said that PTA will again arrange meetings between service providers and academia to encourage development in the ICT sector. ISLAMABAD - PTCL, understanding the rapidly changing business environment and its growing reliance upon automation, has introduced region’s largest Data Centres in Karachi and Lahore. These centers are certified by the internationally recognized certification body, EPI. This certification by an international body is the first data centre certification in Pakistan’s history and proves PTCL’s commitment to providing state of the art products and services backed by engineering and support for the Government and Enterprise markets of Pakistan, says a press release issued here on Wednesday. PTCL Data Center services is an ideal choice for companies who want the flexibility to house their Primary, Disaster Recovery and/or Business Continuity sites and choose from a variety of cost reducing services as their business demands. PTCL Data Centre solution provides customers managed and hosted cloud based services that comprise of computing as a service, processing as a service, storage as a service, software as a service, application hosting, infrastructure hosting, caging, co-location, disaster recovery as a service, backup solutions, hosted business solutions, unified communications and telepresence switching. President PTCL Walid Irshaid said “PTCL is heavily investing in these ICT assets on behalf of our customers so that they can focus on their core competencies. Getting our Data Centers certified is further evidence that PTCL is committed to provide technology to the Govt and Enterprise markets of Pakistan of international standards. This certification by an internationally recognized organization ensures that PTCL Data centers provide a reliable, responsive and resilient infrastructure, is designed and built using international standards and provides a secure, managed, climatically controlled environment for the housing and hosting of sensitive, mission-critical data and applications. KARACHI: Pakistan Telecommunication Company Limited (PTCL) has deployed its first ever Fiber to Home service based on Gigabit Passive Optical Network (GPON) technology in Karachi. PTCL with its commitment to provide the latest technology and innovative products to its customers has introduced its first ever Fiber to Home service in Karachi while this service is also available in Lahore and Islamabad as well, says a press statement received here on Wednesday. GPON provides a capacity boost in both the total bandwidth and bandwidth efficiency through the use of larger, variable-length packets. It not only provides substantially higher efficiency as a transport network, but also delivers simplicity and superb scalability for future expansion in supporting additional services with lowest cost for all modes of operation. With this unique capability PTCL has raised the bar of customer experience by many notches. Initially the service includes unprecedented voice quality on telephone, extremely fast and reliable broadband connectivity and digital television with amazing video quality. PTCL’s SEVP, Business Zone South, Abdullah Yousef Abdullah said on this occasion, “PTCL will widely deploy Fiber to the home technology of which the first step has already been taken in some parts of Karachi giving our valued customers the opportunity to experience the latest technology and the best quality of service. Our aim is to delight our customers with such innovative products right at their doorstep which suits their life styles and spending budgets”. As part of the mobile broadband promotion campaign, PTCL's EVO-WiFi Cloud at 3G speeds (upto 3.1 Mbps) offers a mobile hotspot that intelligently converts your home/work/vehicle space into a personalized wifi zone anywhere in over 100 Pakistani cities and towns covered by EVO service. The EVO-WiFi cloud device costs Rs. 7000 upfront with Rs. 2000 a month for unlimited service. PTCL has recently launched an Android based thin Apple iPAD2 like tablet computer with EVO 3G and WiFi connectivity built-in. 3G EVO Tab is a 7 inch touch screen tablet with built-in EVO service to offer wireless broadband internet on the go in more than 100 cities and towns across Pakistan. Powered by Google Android Froyo 2.2 Operating system, 3G EVO Tab offers support for both 3G and Wi-Fi for an un-interrupted on-the-go connectivity. With a 5 MegaPixel Camera, a variety of built-in applications, 3G EVO Tab lets users browse, snap, share, communicate, navigate, play games and do a lot more on-the go, thereby making it an ideal connectivity solution for users looking for high speed on-the-go 3G connectivity on an Android platform. PTCL 3G EVO Tab offers convenience and speed with three diverse economy packages to suit individual needs and pockets. Its 12-month bundle offer has been very successful with majority sales in this bracket.Customers can get EVO Tab for as low as Rs 7,999 plus 12-month unlimited EVO service, all at Rs 31,999. In addition to the 12-month contract, EVO Tab offers bundled packages based on 3 and 6 month contracts at Rs 27,999 and Rs 29,999, respectively with 3 and 6 month of unlimited EVO service. LAHORE - The broadband segment of the telecom sector has witnessed a tremendous growth over the years, with subscribers growing by threee-year Compound Annual Growth Rate (CAGR) of 85 percent. According to telecom industry experts, though the growth could be attributed to a low base effect; nonetheless low broadband density of only 0.8 percent compared to country’s total teledensity of 69 percent leaves ample room for further growth. Latest data reveals that in 1QFY12 PTCL’s DSL, customer base increased by 9 percent with a steady market share of 95 percent. Therefore, with available growth room, it is believed the broadband would also shoulder the declining fixed line business. Experts estimate that the broadband will contribute approximately 8 percent to the topline of the company in FY12. They said that the segment growth prospects also stems from being the major beneficiary of company’s CAPEX program. In the last thee years, PTCL capital expenditure stood at Rs24b with major expansionary projects like expansion of optical fibre network in Balochistan to acquiring of VDSL2 bonding technology for high speed data transfer and many more all coming under the broadband segment. The largest telecom operator has underperformed the broader KSE index by 33 percent during 2011YTD, on concerns of its ailing fixed line business segment. However, Muhammad Milwala, a telecom sector expert, believed that fixed line is only one-half of the PTCL coin and investors have overlooked the growth story in PTML (Ufone), PTCL’s 100 percent owned cellular firm. Therefore, in order to capture the complete essence of Ufone’s story, he advises investors to look at company’s consolidated earnings rather than stand-alone which is usually announced at the Karachi bourse after the PTCL board meeting. This investment case is also driven from growth prospects of its broadband business (subscribers witnessed CAGR of 85 percent in last 3 years) that has a potential to cushion the decline of fixed line. Overall, it is expected company to post double-digit increase in consolidated profitability of 20pc. Investors must only look at consolidated statistics as Ufone is becoming a large part of PTCL. Due to the changing dynamics of telecommunication industry (fixed line to wireless technology), Ufone has become the spearhead of PTCL’s earnings growth. As per estimates, the segment contributed approximately 47 percent to company’s topline while, approximately 50 percent of PTCL’ 1QFY12 is attributed to Ufone. During FY12, it is expected the pendulum would further swing towards Ufone, with estimate Ufone’s revenue to surpass that of its parent company and segment contribution to consolidated bottomline is estimated to stand around 68 percent. In addition to Ufone, broadband would also be the potential savior for PTCL. ....Commenting on the adoption of new technologies by MNOs, Yaseen (PTA Chairman) asserts "the time has come for the introduction of 3G and 4G technology in the country". "As long as the MNOs are not hurting the interests of customers, PTA does not actively regulate rates charged by them" reveals the PTA chairman, explaining that in the past when Mobilink was the only MNO in the local market, its rates were regulated much more stringently by the regulatory body, but that this practice was abandoned with the deregulation of this sector. On the other hand, Yaseen insists that the regulator is very much involved in ensuring that customers' complaints and feedback are heeded. He highlights that "PTA is the only regulator in the country that has specific regulations and mechanisms in place to address customers' grievances in the form of the Customer Protection Department (CPD)". Acknowledging that costs related to infrastructure development have gone up for MNOs, he lauded recent moves by different cellular service providers to share infrastructure. He said that not only would such arrangements help lower costs for these companies, but also they would allow better coverage across the country when service providers move into un-served or under-served areas. When asked whether rising costs and a slower pace of growth in the number of cellular subscribers could force out some competitors from the local market, Yaseen responds, "although I personally believe that the size of the local market is big enough to accommodate all existing MNOs; still the market forces will determine the optimum number of operators for the local market". While Yaseen appreciates the efforts of the industry in infrastructure development, he calls on policy makers to "go into 700 and 800 megahertz spectrums as the capital expenditure required in these spectrums is relatively low and they also supported 4G technology adequately". The chairman explains that these bandwidths require lesser infrastructure to cover the same distance when compared to higher bandwidths. He adds that higher spectrums can be tapped once economies of scale emerge and the use of smart phones becomes more popular in the local market. "When it comes to broadband services, we believe the whole nation is currently under served and should be classified as such," he says adding that "the operators should be subsidised to enhance broadband services in the country." Yaseen asserts that "communication is a basic right of every citizen so even if there is a small, secluded village in Balochistan, they should still be provided fixed line as well as broadband services." Chairman PTA also believes that the development of the required infrastructure can be practically achieved "because in the form of USF, the funds needed are available". Muhammad Yaseen also highlights that enhanced coverage of telecommunications networks across the country can be leveraged to turn the country into a communication hub that can connect China and other East Asian countries to other regions. "There are about 20 million smart phones connected to our networks at present, so any operator entering into the 4G realm can count on a prospective market among these connections," says Yaseen, adding that "the total size of the Australian market is 20 million subscribers." He concludes that "even if ARPU is low, the number of subscribers still provides lucrative opportunities in this sector!" PTCL also offers Quad Play Services that includes unlimited voice calls, internet, IPTV and surveillance services. The new package is offered to at Rs.749 / month. Existing customer can also avail this package but they have to pay one time charges of Rs.1500 as downgrade charges. One time Equipment (Smart TV STB & Camera) charges may apply. Library of 500 video on demand. 24/7 service availability from PTCL’s side. Parental control on TV channels and video on demand. Access to free movies, music, classical Pakistani plays, famous cricket matches, educational content exclusively for PTCL broadband customers on ‘Buzz’ broadband web infotainment portal. Telecom sector has a potential to attract billions dollars of Foreign Direct Investment (FDI) as total revenues of telecom operators in the country has been swelled to an all time high Rs 362 billion in 2011 at the end of financial year. The telecom sector has expanded its services rapidly in many parts of the country over the period of past one decade. It is still in the evolving stage to deploy its services in many un-served small cities and villages and companies are plan to increase their operation areas in maximum locations to get handsome number of customers of their different services. According to a report of Pakistan Telecommunication Authority (PTA) the telecom sector contributed more than Rs 116.9 billion to the national exchequer in the outgoing financial year during 2010-11. Accordingly, the GST/FED collections from the sector spike by 20% to reach Rs 52.6 billion in the same year whereas Rs 7.2 billion activation tax collected. According to this report PTA deposits reached to Rs12 billion whereas other taxes reached to Rs 45.2 billion. Cellular income which constitutes major chunk of the telecom revenues was boosted by 11% to Rs. 262 billion from Rs. 236 billion. A modest increase in cellular industry’s ARPU was witnessed from US$ 2.41 in the previous fiscal year to US$ 2.45. The revenues of local loop operators recorded Rs58.32 billion. The wireless operators earned Rs4.84 billion and LDI sector revenues reached to Rs 29.95 billion. The value added sector made Rs 7.02 billion revenues during fiscal year 2011.. The number of mobile subscribers at the end of fiscal year 2011 stood at 108.9 million, showing growth rate of 10%, double than that of the last year. Mobile penetration rose to 65.4% from 60.4% in the previous year. In this report it has been said that during the past three years, PTA has collected around Rs. 40 billion against APC for USF. In its drive to curb grey traffic, the Authority saved revenue of US$ 26 million. Pakistan Telecommunication Authority in its report “Vision 2020” estimated that telecom investments in Pakistan would be landed more than US$ 2.4 billion by 2020. The mobile subscribers’ base is expected to be widened to 161 million, hence approximately 89% of the total population by 2020. A start of a new year and a launch of a new product by PTCL. This time it’s a Android smartphone with EVO 3G built in. This is the third device in a series of products based on the PTCL EVO internet service, first it was the Futura mobile phone luanched by the subsidiary of PTCL i.e Ufone (which was a featurephone btw) and then a EVO tablet on 14th August last year. The name of the device is IVIO Icon Pro and it seems like it is made by the same company that made the EVO tablet. - Ability to talk and surf at the same time. - And best of all, you can use this device with any SIM of your choice! 3 months validity Only Rs. 999! 6 months validity Only Rs. 1,999! Pakistan Telecommunication Company Limited's (PTCL) EVO wireless broadband has become Pakistan's widest broadband Internet network covering 90 percent of the nation's population in more than 180 cities and towns. PTCL has also recently expanded coverage of its fastest Nitro Rev B network to 70 cities. Customers can now cruise with matchless speeds of up to 9.3Mbps with EVO Nitro's Rev B in more than 70 cities. PTCL's EVO wireless broadband is the only wireless broadband network providing Rev A and Rev B connectivity in Pakistan, giving unlimited data volume downloads in unlimited usage packages. Its superior 3G experience comes in a variety of pre-paid and post-paid device and connectivity package options that give customers multiple bill payment and pre-paid recharge options to suit their needs. <i>Pakistan Telecommunication Company Limited (PTCL) claimed that it acquired 95 percent of the DSL market share with increase of 17 percent subscribers’ base in the first half of the current financial year 2011-12, the company financial report said. According to an estimate, the company has nearly been subscribed by 1.5 million users. PTCL’s efforts in DSL business expansion were instrumental in making Pakistan one of the fastest growing countries in the world in terms of broadband growth. The product portfolio was suitably diversified providing unparallel range from 256Kbps to 50 Mbps at competitive pricing to meet individual requirements of a wide range of customer base encompassing urban and rural communities alike. Besides the company special promotions and bundled deals were encourages subscribers to upgrade their connections in terms of speed without any price increase. Moreover, the introduction of Videophone with plug and play feature linking the service through regular DSL connection improved the subscriber experience. The company also introduced FTTH (fibre to the home) in major urban areas to meet the ever-increasing demand of higher bandwidth and superior quality of services. In the half-year 2011-12, ‘EVO’ the wireless broadband service based on 3G technology witnessed a 30% growth in its customer base. This was made possible by introducing various products and packages encompassing latest technology. The 3G EVO Tablet, launched on the Independence Day of 14th August 2011, is Pakistan’s first 3G enabled Android Tablet with built-in EVO wireless broadband for high speed on-the-go internet connectivity. Similarly, economical packages were also offered on the EVO Cloud – the product enabling simultaneous 3G wireless broadband connectivity through Wi-Fi multiple devices. The revenues of PTML (Ufone), the wholly owned subsidiary of PTCL also rose by 6 percent in the half year under review. The revenues of PTCL were Rs. 29 billion registering 6 percent increase. Pakistan Telecommunications Company (PTCL) has registered a growth rate of 30% in customers of its internet protocol television (IPTV) service called Smart TV. Its content acquisition strategy is reported to be behind the swift development of the IPTV service's customer care, quality of service and enriched content. PTV dramas, including Fifty Fifty, Aangan Teraah, Aahat, and Dhoop Kinary, have now been added to PTCL Smart TV's video on demand service, as have a range of Hollywood and Bollywood films and children's entertainment. The company says the service's greater digital picture quality, video on demand flexibility, parental lock feature, and the ability to use advanced attributes such as rewind live TV have proved popular with consumers. PTCL says it is now striving to achieve a 9% penetration rate for its IPTV service in Pakistan, in line with the global figure for IPTV distribution in broadband homes. WiMAX technology has achieved a penetration rate of 50 percent of all broadband connections in urban centers in Pakistan. Pakistan has a huge untapped market with only 7 percent of households having subscribed to broadband internet. The fixed market space is virtually untapped and future potential for growth is immense for broadband operators. Pakistan has 4 WiMAX operators, namely Wateen, Qubee, Mobilink Infinity and Wi-Tribe who account for around 29 percent of the broadband market share. Consumers in the country are showing their preference for wireless broadband, which offers a lucrative untapped broadband market. Recently, the WiMAX Forum hosted the South Asia Conference 2012 in Islamabad, Pakistan. The forum conducted the conference under the patronage of Pakistan Telecommunication Authority, and co-organized by Wateen Telecom. The conference was aimed at creating awareness about how WiMAX is a cost-efficient, sustainable and easily scalable solution for broadband distribution. WiMAX can help improve the country's economy by helping industries such as electricity, aviation, oil & gas, agriculture, healthcare amongst others in becoming more efficient, transparent and vertical through its various applications. WiMAX can help resolve Pakistan's electricity crisis through smart grid applications, through efficient and secure electricity distribution. "This success of the technology is unparalleled anywhere else in the world. I am delighted to come to Pakistan and look forward to returning to continue supporting the success of WiMAX operators in the country," said Declan Byrne, president of the WiMAX Forum. The conference included speakers from Airspan, Fanoos Telecom, Gemtek Technology and Banglalion among others who discussed various go-to-market strategies, planning considerations and applications for WiMAX operators. Alepo, a provider of WiMAX solutions shared how broadband and mobile networks can collaborate for better provisioning of data services for consumers. Mohammed Yaseen, chairman, PTA, shared his vision for the country's broadband policy in enabling the country's economic and social needs, spoke to the delegates present at the conference. "Wateen Telecom is focused on proliferating broadband internet in Pakistan and we are firmly committed to the idea that WiMAX can change every aspect of life in Pakistan for the better. Being one of the pioneers for the technology in the world, Wateen believes WiMAX is the solution of choice for emerging countries and can leapfrog Pakistan to progress," said Naeem Zamindar, CEO Wateen Telecom. Pakistan is among very few countries where various competing broadband technologies have been allowed by the regulator. Though current broadband subscriptions are abysmally low at less than two million; PTA expects subscriptions and users to reach 19.5 million and 78 million respectively by 2020. Future growth is expected to be driven by wireless broadband, as it can substitute fixed broadband (DSL) and offer mobile internet through dongles & wifi hotspots. The WiMAX (Worldwide Interoperability for Microwave Access) technology is a serious contender for future broadband uptake in Pakistan because it can roll out broadband very quickly, and operators can rapidly expand their footprints if things work out with the telcos. Globally, the highest WiMAX penetration is witnessed in Pakistan, with nearly one in three wireless broadband subscribers using WiMAX technology. Canada-based Commonwealth of Learning (COL) and Allama Iqbal Open University (AIOU) have agreed on a draft plan to launch open-schooling system in Pakistan for achieving millennium goals, ensuring universal education by the year 2015. The main features of the draft plan were explained at a presentation given by COL consultant Dr Tony Dodds at the AIOU’s headquarters. The COL was created by commonwealth heads of governments to encourage development and sharing of open learning and distance education knowledge, resources and technologies. Core funding comes from voluntary contributions from member governments in which Canada is the largest contributor. Under the proposed plan, an Institute of Open Schooling and Lifelong Learning will be established at the AIOU to impart education at primary, middle and higher secondary levels throughout Pakistan through distance and open-learning system. The system has already been successfully tested in many other countries, including the UK, India, Namibia and Tanzania, to successful overcome illiteracy. AIOU Vice Chancellor Prof Dr Nazir Ahmed Sangi, on the occasion, said that open schooling system would be a milestone in achieving the millennium goals. The plan, he said, will be implemented in consultation and cooperation of provincial governments and other federal government institutions. The AIOU was looking forward to act as facilitator and coordinator in fighting illiteracy at all levels. He said the university had the required capacity and academic potential for developing necessary curriculum and other parameters to implement the plan in its true spirit. Mukhtar Hussain Talpur, AIOU Bureau of University Extension and Special Programmes director, said the proposed plan would provide a roadmap for upgrading literacy at all levels in the country, particularly in the far-flung and less-developed regions. He said the AIOU would be seeking support from relevant institutions from home and abroad to achieve the desired objectives. An NGO, Plan International, has already provided Rs 18.4 million to the AIOU to promote primary and post-primary education in the country. Dr Dodds explained that through the open and distance learning millions of Pakistanis, currently outside the formal educational system, would have access to opportunities to undertake organised educational activities at pre-tertiary level which would improve the quality of their lives. Prime Minister Yousaf Raza Gilani has announced that the federal government will allocate Rs17 billion for the development of Information Technology (IT) infrastructure and broadband connectivity in un-served areas in the next budget. Addressing the third convocation of Virtual University at the Expo Centre here on Saturday, the prime minister said that education in general and science and technology education in particular were “a matter of life and death” for the nation. He said his government had already spent Rs22 billion on IT. He also announced an IT award of Rs20 million for talented students from backward areas. Gilani said that broadband centres would be established in each union council and these would provide 30,000 jobs this year. He also announced the establishment of 30 more Virtual University campuses throughout the country including in the Federally Administered Tribal Areas, Azad Jammu and Kashmir and Gilgit-Baltistan. The prime minister directed the IT minister to expedite the awarding of contracts for 3G mobile technology in Pakistan. He said that this technology would create jobs and promote development. He said that he had directed the finance minister to create 100,000 jobs in the budget for 2012-13. “An educated Pakistan, which is the vision of Virtual University, is in line with my government’s determination to provide an affordable and quality education to all at the same time. I want the university to undertake expansion projects and increase its nationwide presence. I have already approved, in principle, the setting up of a custom-built Virtual University campus in every district of the country. I am very glad to hear that the first four campuses under this initiative have already started functioning,” he said. Gilani said though education was a provincial subject after the passage of the 18th Amendment, the federal government was “committed to increasing the share of GDP for education in line with the Millennium Development Goals”. Pakistan currently has one of the lowest rates in the world of spending on education as a proportion of GDP. The prime minister praised Virtual University for its “quality and innovative techniques of delivery”. He noted that the university’s open course ware website had been recognised as the best in the world by the Open Courseware Consortium that included such world leaders as the Massachusetts Institute of Technology, Stanford and Yale. Prime Minister Syed Yousaf Raza Gilani has inaugurated Pakistan Telecommunication Company Limited (PTCL) celebration of achieving Pakistan’s first one million Broadband customers as part of the national commemoration of World Telecommunication & Information Society Day 2012 held here at Pak-China Friendship Center, says a press release. “Telecommunications and IT are bringing encouraging economic dividends and inspiring lifestyle choices for the people of Pakistan,” said Prime Minister Gilani, who was the chief guest of the mega event and exhibition organised jointly by PTCL and Ministry of IT & Telecom to mark the WTIS Day 2012. This year’s theme for WTIS Day is ‘Women, Girls & ICT’. “The role of ICTs matter immensely for gender equality and empowerment of women,” said Prime Minister Gilani. “ICTs are a force multiplier for girls’ education, enabling them to build their future on a level-playing field with their male counterparts.” The event was also addressed by Federal Minister of IT & Telecom, Raja Pervaiz Ashraf; Federal Secretary IT & Telecom, Farooq Ahmed Awan; and PTCL President & CEO, Walid Irshaid. The event was attended by senior government and PTCL officials, a large number of students, members of the civil society and media. Earlier, Prime Minister Gilani visited PTCL’s impressive pavilion exhibition set up in the main hall of the Pak-China Friendship Centre. The Prime Minister experienced first-hand telecom giant’s state-of-the-art products and services, and was briefed by PTCL’s team about their various features. President & CEO PTCL, Walid Irshaid, also presented on the occasion special 1 million Broadband commemorative shields to Prime Minister Gilani and Minister IT & Telecom, Raja Pervaiz Ashraf. The mobile phone subscriber base is expected to cross 160 million mark and broadband subscribers to cross 19.5 million by 2020, according to Pakistan Telecommunication Authority’s ‘Telecom Vision 2020‘ report. The number of fixed line subscribers is expected to remain in the range of five million, the report added. The broadband connections have increased from 1.49 million in June last year to 1.92 million and this increase is mainly attributed to continuous aggressive launching of products like EvDO, WiMax, FTTP in the broadband arena by telecom companies at affordable price. It said broadband will be the main medium of personalised communication from which users will be able to effectively and affordably access any service from any device or network. In the next ten years, 4G technology will usher the usage of new applications such as IPTV and Web-TV. In the future, PTA will be concentrating on re-farming of spectrum to cater the increased demand of broadband and wireless technologies, envisioning telecom to become the communication highway for sharing of knowledge as well as reaching out to a large segment of population in education and health services delivery. The report further said that the telecom roadmap for 2020 is likely to witness 100 per cent infrastructure development wherein a wide range of services will be available on converged infrastructure platform. Talking to APP, an official said on Wednesday that Rs 1.13 billion have been earmarked for SUPARCO, SCO and Ministry of IT to execute 16 approved projects worth Rs 11.1 billion. The important projects that will be executed this year include construction of Cross-Border Optical Fibre Cable (OFC) for alternate international connectivity and laying of OFC to connect remote areas of Gilgit-Baltistan and AJK. He added that SUPARCO would develop various laboratories for National Satellite Development Programme in Lahore. The other projects are development of Compact Antenna Test Range (CATR), Satellite bus development facility (Phase-I), development of a Satellite Assembly Integration and Test (SAINT) and Altitude & Orbital Control System (AOCS) Center. The current global economic recession has had a spiral effect worldwide and only a few segments have been able to resist its impact. However, the amazing growth of broadband in the last decade is an outstanding national success story. High-speed internet streaming is revolutionising the way people learn, communicate, work and do business. Broadband internet is now the backbone of corporate services and even small businesses. Owing to their own limitations, some telecommunications operators are making misleading claims about the state of broadband penetration in Pakistan by incorrectly linking it with the country’s economic situation. Contrary to such ill-informed claims made in haste, the country has witnessed a 70 times increase in broadband proliferation in the last six years. The numbers speak for themselves. According to the Pakistan Telecommu-nication Authority (PTA) data, the number of broadband internet subscribers in Pakistan increased from less than 27,000 in 2005-2006 to more than 1.9 million in 2012. One website, Internetworldstats.com, puts Pakistan’s total internet users at more than 29 million with a population penetration of 15.5 per cent. The total number of fixed phones and mobile phone subscribers stand at 3.1 million and 118.3 million, respectively. The PTA data further reveals that broadband internet put up an impressive growth rate of 28 per cent from June 2011 to March 2012, surpassing a mobile growth rate which stood at nine per cent for the same period. Given these facts, conveniently blaming the economy to cover operators’ own institutional limitations and lack of infrastructural capacity are tantamount to a disservice to the nation. Broadband services were first introduced in Pakistan in 2001, by installing equipment on existing copper lines used for provision of telephony services. Initially, DSL broadband services were only provided to a small consumer base of high-end users in the big cities. But progress was slow and penetration was negligible. In response, the Government of Pakistan introduced the Broadband Policy of 2004, revising backhaul bandwidth charges downwards to propel broader penetration. Broadband growth has been achieved during recession years, where the average GDP growth rate has remained less than four per cent per year. Today, broadband internet is a household product and one connection serves an entire family. Pakistan is ranked among the top few countries to have registered high growth in broadband internet penetration in recent years. According to global broadband tracker Point Topic’s 2011 report, Pakistan stood in fourth place in Asia with 46.2 per cent growth in subscriber base whereas Sri Lanka and India were placed at number 11 and number 14, respectively. The tremendous potential of broadband internet in Pakistan can be gauged by analysing the last four years’ progress through the PTA’s data. Broadband internet penetration was less than one percent per household in 2008. In 2012, it has reached seven per cent. This mammoth growth has fuelled a broadband revolution, resulting in an increase in customer base and also helping wireless broadband technologies to expand setting the economic wheel in motion. Despite hollow claims, the truth is that the growth trajectory of broadband is not the same for all operators. A sluggish economy and power crisis is not the reason for this stark dichotomy. Rather, it depends on an operator’s network, infrastructure capabilities, investment size, business model and growth strategy. Technology takes time to grow but once the wheel is set in motion, the effect is viral. Pakistan Telecommunication Company Limited (PTCL) is offering free 3G EVO Nitro 9.3 Mbps USB with 3 months free internet for advance payment of Rs 6,000 only. The small and compact 3G Nitro USB is an easy-to-manage USB dongle that offers a truly mobile Broadband internet experience at hyper fast speeds up to 9.3 Mbps. The 200 plus EVO coverage areas ensure that PTCL customers remain connected on the go. All new customers can avail this offer by making advance payment of Rs 6,000 only. The offer comes with free 3G EVO Nitro USB and 3 months free internet. PTCL is continuously building a truly mobile telecommunications infrastructure across Pakistan, said PTCL Senior Executive Vice President (SEVP) Commercial, Naveed Saeed. The imports of various telecom products witnessed increase of 23.89 percent during the fiscal year 2011-12 as against the same period of the previous year. The over all imports of telecom sector reached to US$1.268 billion during July-June (2011-12) against the imports of US$ 1.023 billion recorded during July-June (2010-11), according to data of Pakistan Bureau of Statistics. Among the telecom sector, the highest increase of 31.63 was witnessed in mobile phones, imports of which increased from US$ 522.825 million to US$688.170 million, the PBS data revealed. The imports of other telecom apparatus increased from US$500.712 million to US$579.899 million, showing increase of 15.81 percent. Meanwhile, during the month of June 2012, the telecom imports increased by 13.04 percent as compared to the imports of June 2011 while decreased by 20.43 percent when compared to the imports of May 2011. The telecom imports in June 2012 stood at US$ 96.680 million against the imports of US$ 85.527 million in June 2011 and US$ 121.499 in May 2012, the data revealed. During the month under review, the mobile phone imports surged 25.63 percent when compared to the imports of June 2011 and decreased by 11.17 percent when compared to the imports of May 2012. In June, the mobile phone imports were recorded at US$ 56.176 million against the imports of US$ 44.714 in June 2011 and US$ 63.237 in May 2011. However, in June 2012, the imports of other telecom apparatus decreased by 0.76 percent and 30.48 percent as compared to the imports of June 2011 and May 2012. The imports of telecom apparatus in June 2012 stood at US$ 40.504 million against the imports of US$ 40.813 million in June 2011 and US$ 58.262 million in May 2011, the data revealed. It is pertinent to mention here that the overall impost from the country during the fiscal year 2011-12 increased by 11.13 percent. The imports during the year under review were recorded at US$ 44.912 billion against the imports of US$40.414 billion, according to the PBS data. It can, of course, be argued that quality and institution-building will take some time. However, with the initiatives of some of the best American universities, the pace of reform can be quickened. Initiatives such as MIT Open Courseware (OCW), Open Yale Courses (OYC) and EdX now require just an internet connection and a laptop to access this world-class education. The word needs to be spread so that as many people as possible take advantage of this. What American universities are doing is the beginning of a global reform in higher education. In our recorded history, no civilisation has ever opened its most advanced knowledge for others to benefit. We believe that nothing but the essence of real knowledge can truly transform our country. It is with this faith that we meet every weekend on the outskirts of Lahore and try to gather as many people as possible to tell them what new opportunities have opened up in the shape of OCW and OYC, and how they can use those to transform themselves and society. We also help underprivileged students understand the OYC lectures. We believe that these opportunities being offered by world-class universities can truly transform not just Pakistan but every country in the world. Such initiatives need to be highlighted on broader and bigger forums as they represent far better opportunities than what is being offered by the profit-oriented education providers in Pakistan and other countries. The national focal point of this distance learning initiative selected by the HEC is the Latif Ebrahim Jamal Science Information Centre located at the University of Karachi. Over 2,000 lectures from professors based in the US, UK, Europe and Australia have been delivered through this mechanism during the last three years. A major advance in distance learning was the availability of MIT OpenCourseWare free of charge to the world. This provided over two thousand excellent undergraduate and postgraduate courses in various disciplines delivered by the MIT faculty. There are about 20 million website visits by students from 215 countries to benefit from these courses annually and an astonishing 100 million users have benefited from them so far. We set up a mirror website of the MITCourseWare in Pakistan to facilitate downloading when I was chairman of the HEC. These Massive Open Online Courses (MOOCs) are also being introduced by Stanford and other universities. One such initiative, ‘Udacity’, was initiated by a Stanford professor last year and attracted 160,000 students to register for the course on artificial intelligence. The fastest growing distance learning initiative, ‘Coursera’, was started by two Stanford professors of computer science and has already enrolled more than two million students worldwide. Harvard University has also followed the same path, teaming up with MIT to start online courses under a programme termed ‘edX’. These will be available free for developing countries. Apple-iTunesU also offers access to websites of the leading universities in the world including Cambridge, Oxford, Yale etc, where free video lectures are available. The Khan Academy based in California has been providing school and college level materials for many years, many of which are dubbed in Urdu by a group based in NED University, Karachi. Recently a meta search engine has been developed at the International Centre for Chemical and Biological Sciences at Karachi University to quickly search through all these materials, and arrangements have been made to make these materials available to students and academics in Pakistan free of charge through internet and television. The Latif Ebrahim Jamal Science Information Centre is the HEC designated national focal point for the video conferencing and distance learning programmes. The formal inauguration of educational TV is expected to occur within a couple of months. This will be a huge leap forward for education in Pakistan, and I am thrilled to be a part of this exciting initiative to help bring quality education to the doorsteps of some 100 million youngsters of Pakistan who are below the age of 19. Minister of State for Information Technology Anusha Rehman on Thursday announced to lay optic fiber across Pakistan for spreading telecom facilities to create equal opportunities for masses. She stated this while making a surprise visit to the fiber optic route of Chirah-Lehtrar-Kotli Sattian. “An optic fiber cable of about 40 km has been laid and has proved to be an asset for a populace of about 101,000 people and further initiatives will be taken in future by the ministry of IT to spread optic fiber across all the union council's of the country to connect the entire nation,” she said. So far more than 4,250 km of optic fiber cable has been laid to connect the un-served tehsil's and towns. With these achievements, USFCo and ministry of IT has created a success story for the public-private partnership entities nationally and internationally, she added. Anusha during her visit to the site was accompanied by the secretary MOITT and the senior management of USFCo. Huawei is working on a project which will connect Pakistan and China, through fiber-optic cable. According to the Associated Press of Pakistan (APP) on Monday, citing an unnamed source at Huawei, the connection will run from the countries' borders near Khunjerab to Rawalpindi, spanning a distance of 820km. The project will cost US$44 million and will be completed within a span of two years, the report noted. The new connection will help with connectivity issues and assuage security concerns in Pakistan, the source added. At the moment the country is connected to the Internet through a few undersea cables so the new connection will bring added redundancy which can reduce Internet downtime and additional security. The project is also expected to stimulate trade, tourism and IT awareness in the region and generate economic opportunities, the source added, noting it is set to generate revenue of 1.5 billion rupees (US$24.3 million) in its first three years. In March this year, a fiber optic cable in the Arabian Sea near Karachi got cut and resulted in nearly 50 percent decrease in Internet speed across Pakistan, affected almost 50 percent of Pakistan's Internet traffic.